This is Blog Appetit's sixth blog-o-versary. I like to mark my blog's anniversary with either mawkish sentiment or a celebration recipe. This year I did both. You can read the sentimental part here. Now on to the recipe. There's a lot of background on this pumpkin curry dish. First I love Thai pumpkin curry in all of its guises and wanted to create my own version. Next I love baking things in pumpkins -- to date I've made custards, South American corn stew, turkey chilis and soups in pumpkins, so I've got a theme going on. (Unfortunately, none of these dishes are on the blog. Yet.) I also like cooking with pumpkins and winter squash so you'll find lots of recipes and how tos on the blog for that. 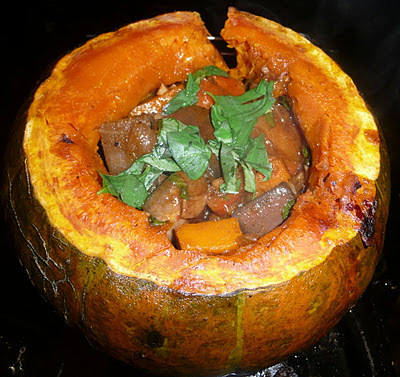 And when it comes to cooking savory dishes in a pumpkin my preference is for the tasty, nutty flesh of the kabocha, also called Japanese pumpkin and a type of winter squash that is reportedly used in Thailand. Also, aside from whacking off the pumpkin "lid" and cleaning out those pesky strings and seeds (really it should just take you a few minutes), it is a very easy recipe but has a wonderful wow factor making it a perfect celebration dinner dish. Like for a blog-o-versary. You may be able to “harvest” the cup of squash chunks for the stir fry during your pumpkin prep. If not, use the sweet potato pieces instead. (If you need tips on cutting and cleaning a pumpkin, please check out my pumpkin "boot camp" post.) If you are avoiding animal products, be sure to read the ingredient label of your red curry paste. Some are made with shrimp and many have fish sauce. The level of spiciness varies between brands of curry paste, so you may need to increase or decrease the amount accordingly. This recipe will serve about 4 people if it’s the only main dish but more if there are other entrees or a lot side dishes. I served this over red jasmine rice, but regular white or brown jasmine or other rice would work well. ½ cup fresh Thai or Italian basil, divided. Preheat oven to 350 degrees. Cut top off pumpkin, reserve. Clean out seeds and strings. Pour can of coconut milk into pumpkin. Cover with reserved lid. Put on a rimmed baking dish or pan. Bake for 35-45 minutes until just tender. While the pumpkin is baking, make the curry. Heat oil in wok or large fry pan. Sauté onions, garlic and ginger until the onions are beginning to brown and soften. Add the carrots and peppers and stir fry or sauté for a few minutes until slightly charred and browned. Add eggplant and squash chunks. Stir fry or sauté until eggplant and squash have begun to soften and brown. Add mushrooms. Stir fry or sauté for a minute then add the red curry paste. Mix well. Add the wheat gluten or tofu and continue to stir fry or sauté for a few minutes. Take off heat and reserve until the pumpkin is ready. Once the pumpkin’s flesh is just tender (test with a fork), remove the baking pan from the oven, but keep the oven on. Wearing oven mitts, remove top and carefully pour coconut milk into stir fry vegetable mixture. Be careful not to rip or tear the pumpkin shell. Bring vegetables and coconut milk to a simmer, stirring frequently until the vegetables are almost cooked through and the liquid has reduced to a thick sauce. Taste and add more red curry paste if desired. Stir in ¼ cup of the basil, cooking for an additional minute. Spoon curry inside pumpkin until packed, replace pumpkin lid and return to the baking dish and place in the oven for about 30 minutes or until pumpkin flesh is soft all the way through and curry is heated through. To serve, remove the lid, sprinkle with remaining basil and scoop out some of the pumpkin flesh with the curry. A note about pumpkin size and integrity. If your squash proves to be too small (which has happened to me), just reheat your extra veggie curry and serve alongside the pumpkin encased version, or refill your pumpkin as the contents diminish. I did have an unfortunate tear when I poured out the coconut milk from the pumpkin in the photo above but was able to “mend” the rip with skewers and the squash held together admirably during cooking. This is a spectacular recipe. I love it! Curry in all its forms really speaks to me; and who can resist a whole pumpkin? Sigh - so many dishes, so little time! But this on my list. Thanks. I love all kinds of curry, too. Let me know when you make this and how it came out! Love the taste and mouthfeel of this! That is a good idea. I will have to remember that. As someone who has been a chef for years, I like that.